Please call the office at (519) 850-HEAL to book an appointment. You may also email Dr. Persaud at heal@ody.ca. You may download a pdf of our intake forms below. If you don't have a copy of Adobe Acrobat Reader click on the image below to download a free copy of the reader. Click here for a map of the office. There is ample parking with entrances off Adelaide St. N. and also Grosvenor St. Please enter off Adelaide Street and parallel park adjacent to the small hill. Your car will face towards the east and there is a right-of-way that exits onto Grosvenor Street. There is also free street parking on either Grosvenor or Wallace streets. Please do not park at the variety store lot. Monday - Friday - 10 a.m. to 8 p.m.
Other appointments can be made outside of these hours. Please ensure to give at least one business day cancellation notice. 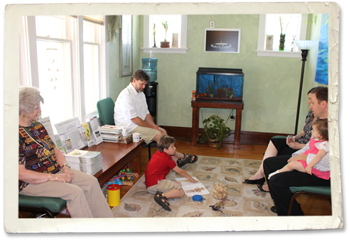 This will allow for consideration of other patients who would also like to schedule an appointment. For appointments cancelled on the same day, the full cost of the appointment will be charged. Consideration will be given to unforeseeable circumstances, at the discretion of the Clinic of Dr. Reina Persaud, BSc, ND. Payment for Naturopathic Health visits are covered by your extended health coverage plan, the same plan coverage as dental, physiotherapist, chiropractor, registered massage therapist, optometrist, audiologist and other paramedical health care providers. If you are not covered by such a plan, keep your receipts (visits as well as supplements) as medical expense deduction on your tax return as an eligible medical expense in the Income Tax Act and regulations. Dr. Reina Persaud, BSc, ND is legally required to safeguard your health information. Health information includes information that can be used to identify you that has been created or received about your past, present, or future health or condition, the provision of healthcare to you, or the payment of this healthcare. We recognize the importance of your health information and take all steps appropriate and necessary to maintain the privacy of it. Reina Persaud, BSc, ND is required by law to maintain the privacy of your health information unless otherwise advised by you in writing that information should be released for medical and or insurance purposes. For information about our qualified staff click here. Disclaimer: The goal of this website is to inform patients and potential patients on the benefits of Naturopathic Medicine. It is not to be considered as medical advice without a physical exam, medical history and appropriate laboratory work up. 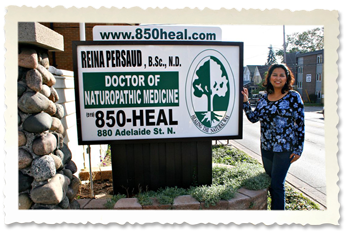 Dr. Reina Persaud, BSc, ND does not assume any responsibility of how the information on this site is used.